at Phillips and Lloyd’s Book Store. 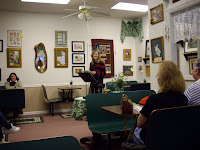 On March 26th, Linda M. Smith was the featured reader. tea, pastry, and poems --all delicious. Brenda Kay Ledford read a newly completed poem. as did Maren O. Mitchell and others. are welcome to read a poem in the open mic reading. founder of this innovative program.